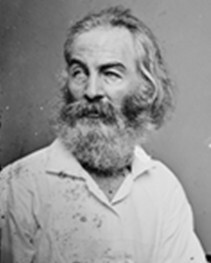 Civil War Letters of John W. Derr: Drum-Taps...Walt Whitman Again! I spent the last week in Texas and Arizona and had some time to finish reading Walt Whitman's short poetry book, Drum-Taps while on the various flights. I had not been one prone to reading poetry, but with this project and my interest in Walt Whitman, I have found myself enjoying the content and depth of feeling in his writings. Some of these poems, in my opinion, are rather "corny" and not to my liking, but others are very touching. For example...I would put his poem Song of the Banner at Daybreak...into the "corny" category, while others such as Come up from the Fields Father...and...The Wound-Dresser...are very well done. There are a few that are just plain excellent...Dirge for Two Veterans....I Saw Old General at Bay....and my favorite...Ethiopia Saluting the Colours. The latter being poignant, thought provoking...and slightly sad. In my freshman year in college I was assigned a topic for my English 101 research paper. That topic was: The Effects of the Civil War on the Poetry of Walt Whitman. I spent two weeks researching and writing the paper. Having always received "A's" in high school English, I exerted limited effort on the task. The result was a failing grade on the paper. I have always remembered that disaster and I guess that prompted me to go back and do the work that was never done by a lazy college freshman. I am glad I did. Why rising by the roadside here, do you the colours greet? Why wag your head with turban bound, yellow, red and green? Are the things so strange and marvellous you see or have seen? COME UP FROM THE FIELDS FATHER. O a strange hand writes for our dear son, O stricken mother's soul!